Background: Electromagnetic navigation bronchoscopy (EMN) is a novel technology which allows localizing peripheral lung lesions and mediastinal lymph nodes for sampling and thus increasing diagnostic yield of Flexible Bronchoscopy. Objectives: A prospective study was conducted to investigate the diagnostic yield of EMN with lower average fiducial target registration error (AFTRE) and rapid on-site evaluation (ROSE). Methods: Consecutive patients with peripheral lung lesion (PL) or enlarged mediastinal lymph node (MLN) which could not be diagnosed by conventional techniques and/or if the patients were not suitable for such interventions were included. The navigation procedure was continued once registration error was reached below/equal to the absolute value of 5 mm. ROSE was performed by an expert cytopathologist. Results: A total of 76 patients; 22 having only PLs, 41 having only MLNs, and 13 having both PLs and MLNs together were enrolled. Thirty-two of 35 PLs (91.4%) and 85 of 102 MLNs (83.3%) were successfully sampled. Overall diagnostic yield was 89.5%. PLs and MLNs were further grouped according to their size (PLs: <20 mm vs ≥20 mm, MLNs: <15 mm vs ≥15 mm). The sampling yield was independent of size for both PL and MLN (P = 1.00, P = 0.38). In diagnostic EMN cases, mean AFTRE was 4.33 ± 0.71 mm, whereas it was 5.16 ± 0.05 mm (P = 0.008) in nondiagnostics. The total duration of procedure was 36.17 ± 9.13 min. Pneumothorax was observed in three patients (3.9%). Conclusion: EMN with low AFTRE in combination with ROSE is a reliable method with high sampling and/or diagnostic rate in PLs and MLNs. Electromagnetic navigation bronchoscopy (EMN) is a novel technology enabling to localize PL and MLN and increasing the diagnostic yield of FB via conducting the biopsy accessories to the exact place of interest. Numbers of studies have proved diagnostic superiority of EMN over conventional FB in the diagnostic management of PL and MLN [Table 1]. ,,,,,,,, However, average fiducial target registration error (AFTRE) values varies between the studies considerably and its importance in the diagnostic yield has not yet been emphasized. A prospective study was conducted to investigate the diagnostic yield of EMN combined with ROSE, and to study the impact of AFTRE on the technique. From January 2008 to May 2010, consecutive adult patients (>18 years age) presenting with PL and/or enlarged (>1.0 cm) MLN were evaluated. The subjects with normal endobronchial findings by FB, and those with PL/MLN not suitable for CT-guided transthoracic needle biopsy, and those not suitable for mediastinoscopy or thoracotomy due to comorbidities (Emphysema, respiratory insufficiency, etc.) were enrolled in the study. Pregnant patients and those with implantable pacemakers or defibrillators also were excluded. The study protocol was approved by the local Ethics Committee (119-3197, October 01, 2007). Informed and written consent were obtained from all subjects. Patients were followed-up for at least 2 years after the procedure. All patients underwent chest CT scans with 8 linear, collimation 1-2.5 mm and increment of 1-2.5 mm. EMN was performed in several steps. The CT data was imported into the software in digital imaging and communications in medicine (DICOM) to plan the procedure. This information was used to reconstruct graphical axial, coronal, and sagittal view of the chest and virtual images of the bronchial tree. Five to seven prominent anatomic landmarks (main carina and major bronchial bifurcations) were marked as reference points on the virtual bronchsocopy images provided by software and the targeted lesions were also marked on CT images. The same landmarks were then used during real-time bronchoscopy for superimposition of the CT data on the actual bronchial anatomy. When the registration phase was completed in EMN, AFTRE, the radius of expected difference between the locations of the tip of the steerable probe in the actual patient, compared with where it was expected to be in its virtual state, appeared on the screen. The navigation procedure was continued once the AFTRE was reached below or equal to the absolute value of 5 mm. The locatable guide (LG) coated with the extended working channel (EWC) was advanced toward the target. When a distance less than 1 cm between the probe tip and the lesion was achieved, the LG probe was removed and the EWC was left in place to obtain washing, brushing, and transbronchial biopsies from the PL, and transbronchial needle aspiration (TBNA) in MLN. For MLN, once the target was reached by LG, a dent was formed by pushing its tip to the mucosa. After LG was withdrawn, the needle was advanced through EWC and stuck into the dent. The transparent virtual bronchoscopy image of the tracheobronchial wall provided by software was also used during TBNA of targeted lesion. Fluoroscopy was not used during entire procedure. All patients were evaluated with chest radiograph to identify any pneumothorax after the procedure. Bronchoscopy was performed in combination with ROSE, which is available at our institution. In this procedure, cytological material obtained from transbronchial needle aspirates, bronchial brushings, or forceps biopsy imprints were immediately smeared onto glass slides by an experienced cytopathologist (KC). Depending on quantity, at least one air-dried slide was prepared and stained with Diff-Quick for on-site adequacy assessment and preliminary diagnosis. An immediate assessment was given after each pass. Multiple passes were performed for each targeted site until on-site assessment was diagnostic for a disease process or an adequate sample was obtained. The pass number, number of biopsies or aspirations until diagnostic material was obtained, was registered. The remaining slides, dried in air or fixed in 95% ethanol, were stained with May-Grunwald-Giemsa, Papanicolau and hematoxylin-eosin stains for routine cytologic examination. If possible, the rest of the material (loose microtissue cores) on the glass slide was transferred into 10% buffered formalin solution with assistance of a needle tip and processed as cell block for histologic examination. When the cytological material was considered adequate, the procedure was terminated. ROSE findings differentiated between benign or malign disease at first glance, then final diagnoses were achieved by detailed histo/cytopathologic work-up. All statistical analysis was performed using the SPSS (SPSS Inc currently under IBM (International Business MachinesCorporation) Armonk, Town of North Castle, New York, United States) version 15.0. Categorical variables were presented as numbers and percentage and continuous variables were presented as mean ± SD or median. Mean LN and PL size were calculated taking the longest diameter of three dimensions. Mann-Whitney U (for the relation of AFTRE and diagnostic yield), McNemar (for the relation of MLN sampling yield and diagnostic yield) and finally Chi-square test (for the relations of PL/MLN size and sampling yield) were used. Any 'P' value of less than 0.05 was considered as statistically significant. A total of 76 patients (49 males) mean age 55.44 ± 13.60 years, were enrolled in the study. Twenty-two patients had only PL, 41 had only MLN, and 13 had both PL and MLN. Total targeted numbers of PL and mediastinal MLN were 35 and 102, respectively. Among 54 patients with MLN, 13 had only one and 41 had more than one enlarged MLN, summing to 102. The mean size of PL and MLN were 23.11 ± 9.42 mm (range: 10-42 mm) and 16.48 ± 6.54 mm (range: 9-45 mm), respectively. The locations of PL and MLN are shown in [Table 2]. The mean distance from the tip of the LG to center of targeted lesion was 0.63 ± 0.22 cm, and the mean navigation time was 6.39 ± 3.42 min. Mean pass number was four for MLN and three for PL. Mean AFTRE was 4.40 ± 0.72 mm (range, 2.1-5.9 mm). AFTRE in subjects with diagnostic EMN was significantly lowered than that of the subjects with nondiagnostic procedure; 4.33 ± 0.71 mm versus 5.16 ± 0.05 mm (P = 0.008). Thirty-two of 35 PL (91.4%) and 85 of 102 MLN (83.3%) were successfully sampled by EMN [Table 3]. In 76 patients with definite diagnosis 68 was obtained by EMN (89.5%) and 8 (10.5%) by other methods [Table 4]. From all cases, by EMN, 25 patients were diagnosed as having malignancy and the most frequent pathology was nonsmall cell lung Ca (NSCLC) (n = 20); adenocarcinoma (n = 8), squamous cell Ca (n = 5), and undifferentiated NSCLC (n = 7) and five patients were diagnosed with small cell lung cancer [Table 4]. Among 32 PL cases successfully sampled, 14 were benign lesions; fibrotic nodule (n = 11), hamartoma (n = 1), granulomatous nodule (n = 1), massive fibrosis due to pneumoconiosis (n = 1); which were also further confirmed by radiological follow-up and Positron Emission Tomography. 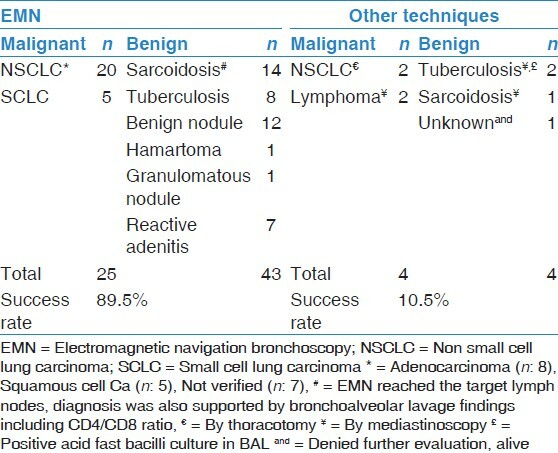 Two out of three unsuccessfully sampled PLs had no bronchus sign on CT. One patient was diagnosed with NSCLC by thoracotomy; bronchoalveolar lavage culture was positive for acid-fast bacilli in one and the lesion responded well to antituberculous therapy; while the third denied further evaluation [Table 4]. All patients were followed-up for a mean period of 2.1 ± 1.2 years. The patients with benign lesions and reactive adenitis did not develop malignancy during the follow-up period. The peripheral lesions were further grouped according to the size, <20 mm (n = 16) and >20 mm (n = 19). The sampling and diagnostic yields of EMN were 93.8% and 89.5% for <20 mm and >20 mm PL, respectively; without any statistical significance (P = 1.00) [Table 5]. The sampling success rate of EMN was 83.3% in MLNs. The sampling success rate was also independent from MLN location (P = 0.74). Regarding the size, MLNs were grouped as <15 mm (n = 55) and >15 mm (n = 47). The sampling success rates did not either differ among these groups (82.1% vs 89.4%, respectively, P = 0.38) [Table 5]. EMN was nondiagnostic in seven patients with MLN. The final diagnoses were lymphoma (n = 2), tuberculosis (n = 2), sarcoidosis (n = 1), NSCLC (n = 1) and unknown in one who denied further evaluation. The total duration of the procedure was 36.17 ± 9.13 min. The procedures were uneventful except spontaneously resolving pneumothorax (n = 3, 3.9%). No adverse reaction was detected during or after procedure. Our study is definitely unique with a high diagnostic yield rate (89.5%) emphasizing the importance of EMN either in PLs or MLNs. This high success rate may have resulted from various factors; the experience of the operator, availability of ROSE, and lower AFTRE score. Rapid on-site evaluation has shown to be highly useful and cost effective method which improves diagnostic efficacy of flexible bronchoscopy, independent of the localization, histology of the lesion and the experience of the operator. , It has been previously reported that ROSE had 85-92% and 100% sensitivity and specificity, respectively, when it is used in combination with EMN and PET-CT. , The present study has shown that the combination of EMN and ROSE overcomes the limitations related to obtaining adequate biopsy specimen. Mean pass number was four for MLN and three for PL representing optimal number for such diagnostic work-ups. The mean value of AFTRE varies between studies and its importance has not yet been well emphasized. The AFTRE values of 6.1, 6.6 ± 2.1, and 4.6 ± 1.8 mm has been reported to be associated with diagnostic yield of 69%, 80.3%, and 67% respectively. ,, The diagnostic yield could be augmented if the AFTRE was less than ≤4 mm. Consistent with this, in the present study, AFTRE values were also around the absolute number of 4 mm (in diagnostics). Thus we can suggest that diagnostic yield in the present study was significantly affected by the low AFTRE. In contrast with PLs, the diagnostic yield of EMN in MLNs has rarely been studied. A study involving 31 patients with MLN with mean size of 28.1 ± 12.8 mm, EMN reported a diagnostic yield of 100%. In the present study, the success rate was 83.3%, not reaching the previous result, most probably due to relatively high number of small size MLNs (mean <15 mm). In the present study, pneumothorax occurred in only three patients (3.9%) similar to other studies in the literature reporting complication rates ranging 2-7.5%. ,,,, None of our patients required a chest tube placement. Reported rate of pneumothorax following conventional transbronchial biopsy is approximately 4%. , Thus, EMN does not seem to increase the risk of pneumothorax. Hence, it can be said that EMN is a safe procedure. In conclusion, EMN along with ROSE and low AFTRE value is associated with high diagnostic rate in the management of PLs and/or MLNs avoiding risks and more invasive procedures. 1. Torrington KG, Kern JD. The utility of fiberoptic bronchoscopy in the evaluation of solitary pulmonary nodule. Chest 1993;104:1021-4. 2. Fletcher EC, Levin DC. Flexible fiberoptic bronchoscopy and fluoroscopically guided transbronchial biopsy in the management of solitary pulmonary nodules. West J Med 1982;136:477-83. 3. Baaklini WA, Reinoso MA, Gorin AB, Sharafkaneh A, Manian P. Diagnostic yield of fiberoptic bronchoscopy in evaluating solitary pulmonary nodules. Chest 2000;117:1049-54. 4. Funakoshi Y, Sawabata N, Takeda S, Okumara Y, Hayakawa M, Maeda H. Bronchoscopically undiagnosed small peripheral lung tumors. Interactive Cardiovasc Thorac Surg 2003;2:517-20. 5. Wallace JM, Deutsch AL. Flexible fiberoptic bronchoscopy and percutaneous needle lung aspiration for evaluating the solitary pulmonary nodule. Chest 1982;81:665-71. 6. Gay PC, Brutinel WM. Transbronchial needle aspiration in the practice of bronchoscopy. Mayo Clin Proc 1989;64:158-62. 7. Shiner RJ, Rosenman J, Katz I, Reichart N, Hershko E, Yellin A: Bronchoscopic evaluation of peripheral lung tumors. Thorax 1988;43:887-9. 8. Schreiber G, McCorry DC. Performance characteristics of different modalities for diagnosis of suspected lung cancer: Summary of published evidence. Chest 2003;123:115-28. 9. Becker HC, Herth F, Ernst A, Yehuda S. Bronchoscopic biopsy of peripheral lung lesions under electromagnetic guidance: A pilot study. J Bronchol 2005;12:9-13. 10. Schwarz Y, Greif J, Becker HD, Ernst A, Mehta A. Real-time electromagnetic navigation bronchoscopy to peripheral lung lesions overlaid CT images: The first human study. Chest 2006;129:988-94. 11. Kupeli E, Karnak D, Mehta AC. Flexible Bronchoscopy. In: Mason RJ, Broaddus VC, Martin TR, King TE, Schraufnagel DE, Murray JF, editors. Textbook of Respiratory Medicine. Vol. 1, 5 th ed. Philadelphia: Suunders Elsevier; 2010. p. 485-505. 12. Gildea TR, Mazzone PJ, Karnak D, Meziane M, Mehta A. Electromagnetic navigation diagnostic bronchoscopy: A prospective study. Am J Respir Crit Care Med 2006;174:982-9. 13. Hauttmann H, Schneider A, Pinkau T, Peltz F, Feussner H. Electromagnetic catheter navigation during bronchoscopy: Validation of a novel method by conventional fluoroscopy. Chest 2005;128:382-7. 14. Eberhardt R, Anantham D, Ernst A, Feller-Kopman D, Herth F. Multimodality bronchoscopic diagnosis of peripheral lung lesions: A randomized controlled trial. Am J Respir Crit Care Med 2007;176:36-41. 15. Lamprecht B, Porsch P, Wegleitner B, Strasser G, Kaiser B, Studnicka M. Electromagnetic navigation bronchoscopy (ENB): Increasing diagnostic yield. Respir Med 2012;106:710-5. 16. Eberhardt R, Anantham D, Herth F, Feller-Kopman D, Ernst A. Electromagnetic navigation diagnostic bronchoscopy in peripheral lung lesions. Chest 2007;131:1800-5. 17. Makris D, Scherpereel A, Leroy S, Bouchindhomme B, Faivre JB, Remy J, et al. Electromagnetic navigation diagnostic bronchoscopy for small peripheral lung lesions. Eur Respir J 2007;29:1187-92. 18. Davenport RD. Rapid on-site evaluation of transbronchial aspirates. Chest 1990;98:59-61. 19. Uchida J, Imamura F, Takenaka A, Yoshimura M, Ueno K, Oda K, et al. Improved diagnostic efficacy by rapid cytology test in fluoroscopy-guided bronchoscopy. J Thorac Oncol 2006;1:314-8. 20. 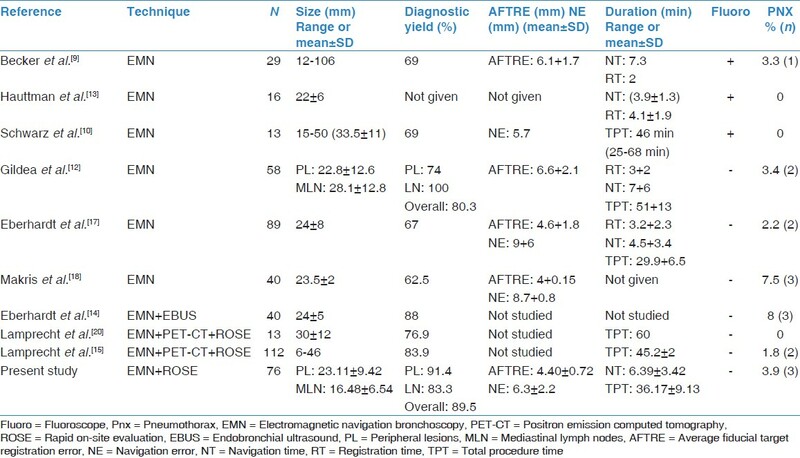 Lamprecht B, Porsch P, Pirich C, Studnicka M. Electromagnetic Navigation Bronchoscopy in Combination with PET-CT and Rapid On-site Cytopathologic Examination for Diagnosis of Peripheral Lung Lesions. Lung 2009;187:55-9. 21. Ernst A, Eberhardt R, Krasnik M, Herth FJ. Efficacy of endobronchial ultrasound-guided transbronchial needle aspiration of hilar lymph nodes for diagnosing and staging cancer. J Thorac Oncol 2009;4:947-50. 22. Anantham D, Koh MS, Ernst A. Endobronchial ultrasound. Respir Med 2009;103:1406-14. 23. de Fenoyl O, Capron F, Lebeau B, Rochemaure J. Transbronchial biopsy without fluoroscopy: A five year experience in outpatients. Thorax 1989;44:956-9. 24. Trkanjec JT, PerosGolubicic T, Grozdek D, Ivicevic A, Alilovic M. The role of transbronchial lung biopsy in the diagnosis of solitary pulmonary nodule. Coll Antropol 2003;27:669-75.